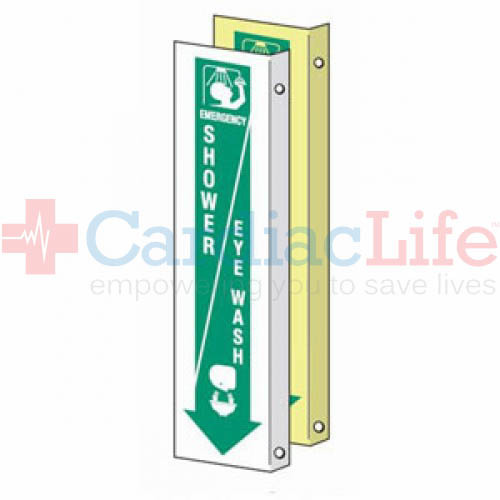 This Glow in the Dark Shower/Eye Wash Sign provides maximum visibility and is great to draw attention to first aid stations. Sign Measures: 4" x 18"
All glow-in-the-dark signs are manufactured using high-quality GLOW BRIGHT® self-adhesive material. GLOW BRIGHT® is a non-toxic, non-radioactive glow-in-the-dark polyester material that stays illuminated for over 10 hours following just 30 minutes of exposure to natural or artificial light. The material will glow the brightest during the first 30 minutes; after activation has ceased it will remain visible in darkness to the adapted eye for over 10 hours. Have a different First Aid Wall Sign in mind? We have other options to choose from. 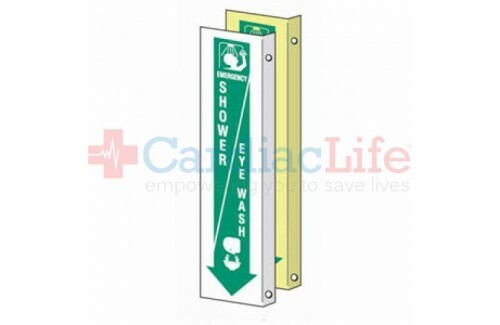 First Aid Location Safety Sign - 4"x18"
AED Location Sign 7" x 10"
Glow-in-the-Dark Emergency Shower Location Sign-4"x18"
Glow-in-the-Dark Emergency Shower Location 3D Tent Sign- 4"x18"